I have come to see the benefits of Facebook over the last few years especially since moving to the UK. It’s an excellent way for me to keep in touch with friends I miss from the US and also to follow some of the happenings in our village here in Cornwall. I tend to be pretty careful when someone “friends me” given previous issues with a woman who stalked us in the past. Although I don’t post our every move, occasionally I do have something on there that would be more information than I want someone who is not a friend knowing about me. I have checked all the privacy boxes to ensure that friends only and not friends of friends can follow and I study fairly carefully even a request from someone who attended the same high school to be sure we even need to be friends. I usually note their politics and religious views partially out of curiosity and a mild concern that they might find me a bit shocking if we differ substantially and also because I find it interesting to see the major changes thirty years later. Seeing someone I remembered as a wild child in the 70’s now pop up with a friend request looking more like their mom or dad and identifying as a conservative Christian can throw me for a minute. This is not meant as a negative comment or judgement, but more as a recognition of who they say they are and what they believe. I tend to be fairly liberal politically and my thoughts regarding faith are not absent, just personal, and I don’t share too much in that area. I feel like my Facebook friends are an interesting slice of my world and a pretty diverse group of folks. There is room for almost everybody on my friends list if I know you or perhaps knew you thirty years ago. I respect the varied viewpoints of others and really only have a few guidelines when it comes to someone I wish to share information with on Facebook. Big points for me go to those who practice kindness and consideration when expressing a differing opinion. Now you can say a lot in opposition to President Obama’s policies or any number of things he is suggesting or supports and I will engage in a conversation with you and work to do it in a respectful way even if we disagree, but when I read this kind of garbage we no longer have anything to talk about because you have shown me who you are and I am not interested in your “friendship.” It’s not Christian, it’s not kind and I am not interested. Sadly, after looking over the hate filled Facebook page with the Obama Prayer, there appear to be at least 1,153,595 people who share her feelings and as such are better able to be her friend. This entry was posted in Choices, Unexplainable and tagged Christian, Conservative, Elizabeth Harper, Facebook, Friends, Gifts Of The Journey, Liberal, Obama Prayer, Political. Bookmark the permalink. It’s hard to have such radical differences with people we know. I have a friend whom I love who might be the funniest guy I know but the crap he says about the President on fb drives me over the edge. Even so, I believe people are as far along as they can be at any given time. I’ve many times made judgements I had to eat for breakfast the next morning. I one thousand percent believe that we, as the human race, are of a dual nature–yin/yang, dark/light–and that both parts are necessary. But sometimes, I’d like to pinch some people. Maybe I’ll blog about this myself. Yes, there is nothing Christian about that! I have noticed many of my friends joining the FB “petition” against that particular group (and I am shocked that the group has that many members). I’m reluctant to join too many FB groups, but think I *need* to join the petition against this sort of hate. I really don’t understand the language some people have used re the president either. Especially when they claim to be Christian. Even more shocking was visiting a friend’s church once, and their minister said he wanted to kill a guy who made a movie with what he considered a non-Christian message. I was deeply disturbed by that. here is the petition to clean up facebook. Don’t need to be a member to sign, but it might bring the violence in this country to a conversation of some kind. I agree. I’ve had that ‘prayer’ arrive in my email inbox a couple times and simply delete it. I find it highly offensive and ironic that someone who professes to follow Christ, who said, ‘love your brother as you love yourself’ would even jokingly support a viral message hoping for harm to our president, much less anyone else. I believe–I’ve always believed–that Facebook is the devil’s playground. From a personal standpoint, I’ll have nothing to do with it because I have a ton of ex-girlfriends out there and I’d be curious to see if time has been kind to them or not. On a broader scale, you have the nuts like the one you site here finding each other. No good can come from it. facebook, hmm. It is incredible to say the least but I am wary of it. Me, who loves blogging and e-mailing, but I don’t get a facebook high like my younger sister does who is fairly regular in updating and getting updates by her iPhone. I have a poor amount of friends (on facebook) and then feel awful when I have possibly offended a couple of people by not recognizing them and so NOT “friending” them. I once caught this on YouTube: a british comedy troupe correctly capturing some of my thoughts about facebook..pretty funny stuff. I am a conservative Christian and have encountered quite a bit of judgement simply by saying so. I can certainly understand your second thoughts on those who state their faith and then tear it to shambles with bile and hate. It irks me like rude drivers that have an ichthus on their bumper. What you shared that I so agree with is what you told your daughter, about watching how she says things and how much it can mean. Our oldest is a teen and we have had that discussion quite a few times. That a “well, let me think about it” will go ever so much further than a “whatever”. Thanks for such an honest post expressing what periodically consider removing myself from FB and staying in touch with real friends and family leads me to stay on. Like you, I consider my spiritual and political beliefs personal and find some of the postings including the one you cited absolutely offensive. You expressed my feelings so well and many times, I too ignore and refuse “friending” requests from people I don’t know or have no wish to read about. I’m one of your quiet readers who log on frequently to “catch up” and enjoy reading your blog. Jennifer ~ I don’t usually join the groups either, but this one bothered me enough to join the one that makes a statement about how wrong it is to pray for the death of Obama. Shelli ~ I think I would have fallen off the church pew if I’d heard a minister talk about wanting to kill someone. Lisa ~ Thanks so much for the petition link, I was not aware it was out there. Suzanne ~ Fortunately, no one sent this to me that I know or I might have had a few words for them. I’ve heard people say, “It’s just a joke” too, but frankly with American history being what it is with previous presidents and other important leaders, I don’t can’t see anything funny in it. UB ~ You’re right about Facebook being the devils playground if people wish it to be, a place where people can congregate to rabble rouse and cause trouble, but used properly it can be quite interesting just like the rest of the internet Plus, since I’ve already seen everyone I would have wanted to see at a HS reunion, I can save that money for trip some place where that I can get a better meal than hotel chicken and I won’t have to squeeze into a pair of Spanx to hold my own against my high school girlfriends. Jenny N ~ Loved what you said about here, ” I can certainly understand your second thoughts on those who state their faith and then tear it to shambles with bile and hate.” The Youtube video was really funny and makes me glad that I was so conservative in my youth or at least glad that there’s no photo evidence to post on Facebook. Cheryl ~ Welcome and thanks for commenting today. I am never sure who is reading until people say hello or leave a comment and I really appreciate you doing so with this topic. Facebook is a funny beast. It can be like one long round the world connection, a virtual garden fence to stand at and share with your neighbors. The other day when my husband’s five year old granddaughter was here for a visit, she sat next to me while was having a conversation on Facebook with my blogging friend Maria in India. Her mother commented then about some of the good ways Facebook can enrich our lives and it’s true. Like you though, I am careful with the friends piece just as I would be when walking through an area I don’t know very well. I pay attention and act accordingly. I have never understood how a religion which professes to be loving can encourage violence, killing and so on. Christianity is not alone in this by any stretch of the imagination. It troubles me deeply. It’s also made me realise as I get older that *teaching* tolerance in a conscious way is a required life skill – one of many – if we are to survive as a planet. 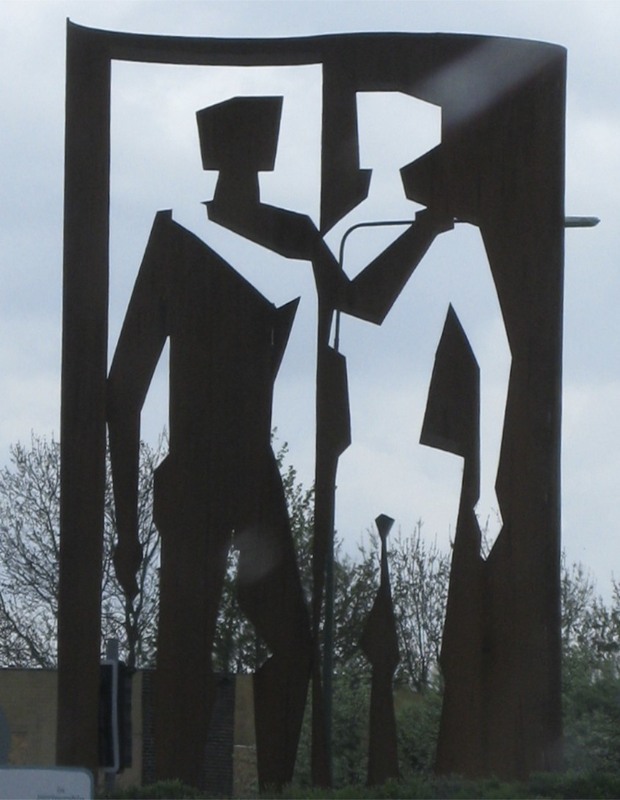 By the way, the statue on your picture is called ‘Couple in Conversation’ and is in the centre of a roundabout in Newbury on the A339. I used to pass it at least twice a week when I was working in Wales. Funny to see such a familiar landmark, and with such an appropriate name for your call for conversation, instead of shouting or worse. Mariellen ~ Thanks so much for identifying the the statue in my post today. I snapped it in the car as we drove past yesterday on the way back from London and forgot to even ask John if he remembered where we had passed it. I had to shoot quickly to get it and I only had the one chance. I thought it was perfect for the post even too before I knew the name of it. Hi Elizabeth, nice you’re remembering me. I came straight in here from fb. I started my fb page last summer and I’m having so much fun with it. I use it to keep in touch with friends, family and to keep track with a growing number of blogging friends. It has enriched my life. But I don’t accept every friend request. I probably did accidentally at the beginning. I usually ask the person how do they know me and if I’m not satisfied, I ignore the request. I don’t believe in adding for the sake of having people on the page but in adding for the sake of managing and keeping in touch with the various people in my life. That prayer was sick. Nothing to do with Christianity. As you say, she can be friends with others on the FB page…. ! Love the statue… must keep an eye out for it. You weren’t far from me… about 20 miles away… ! Gee…I hope I’m still your friend. i, too, have a diverse collection of facebook friends and acquaintances – and generally like it that way. this has led to the need to moderate a few pointed discussions in my comments threads, but i like it when ideas are respectfully discussed. that said? i booted two acquaintances who posted that particular status. my regret was not calling them out on it first. instinctively booted. don’t know what good all of the facebook groups really do. hate is around to stay, i’m afraid. WOW! This is so scarey. These kinds of things make me absolutely crazy. Why do people feel the need to do this?? To publish their thoughts out loud?? Even scarier that so many ‘follow’. I got that email from a friend and deleted it. She has beenmy friend for 50+ years and it saddens me that her new relationship has changed her so much. I have told her I don’t need that particular type of email but she keeps sending them. Now I am conservative and did not vote for him but he is the President and as a widow of a retired veteran do believe in supporting the President at least as far as not being negative and certainly would not wish anybody any harm! 50 years is hard to erase and perhaps her new companion will not last. Funny how it has changed her. How sad. I agree that that kind of thing regarding Obama is pathetic. Too many people think they are so witty.